This is an oreo cookie cake with vanilla buttercream and mmf accents. Rodney did A LOT of work on this cake. 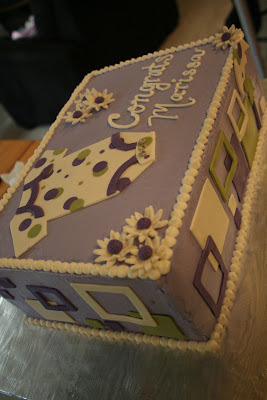 He did most of the fondant work (except for the daisies) and he did a wonderful job. I was pretty happy with this cake until we were on the way to the shower with it. It's three layers and pretty heavy so we opted not to put it in a box and instead, sat the cake (and board) on one of my large cutting boards. I held it in my lap. Five minutes into our drive Rodney asked me if the cake looked like a different color. We pulled over and noticed that the top of the cake was blue and the sides were still purple. The sun was not my friend that day. Once I moved to the back of the car and we were pulling out on the freeway, a giant dog ran out onto the freeway and laid down. This caused a ton of cars ( including us) to slam on our brakes. I (along with the cake) jolted forward and the cutting board hit the back of the driver seat, causing the cake to crack in a few places. I was REALLY upset. So upset that my two year old told me to calm down. No one seemed to notice that there was anything wrong with the cake but it bothered me the entire time it was out, before it was cut. Purple definitely taught me a lesson! You both did a great job. I love that! i really like this cake steph. and don;t worry about being upset about imperfections, perfectionists make great cake decorators! !